The large balcony is private to the unit and is large enough for dining outdoors. The living room is furnished with leather couches, 50 inch plasma, complete entertainment system with surround sound, DVD, and iPod hook so you can listen to all your favorite tunes. The master bedroom has a 43 inch wall mounted plasma. The second bedroom has a 19 inch flat panel television with DVD. The kitchen has granite counter tops, stainless appliances, and is fully stocked with all kitchen utensils, glassware and plates. I lived in St. Augustine from 1998 thru 2007 before moving to Jacksonville for employment purposes where I reside now. Decided to rent the condo instead of sell for my daughters to enjoy in the future. I actually rented a condo for four years in Island South before purchasing in 2002. I looked around in St.Augustine for about 6 months before deciding to purchase in Island South. I felt that Island South was the best condominium complex in St. Augustine. There is only 36 units which makes it more quaint and relaxing then the other big condominium complexes. The grounds are very well manicured and the pool area is always kept clean. It is also located on the most desirable part of St. Augustine beach where driving is prohibited. You can't beat the location of this condo! Is has a beautiful view of the ocean, it's in walking distance to several great restaurants, and the pool is an added bonus. We had a minor issue with the shower, but Jesse was very responsive and resolved the problem. We would definitely stay here again. Thanks, Jesse! We stayed in the condo for a month and we were very pleased with everything. The property looked just like it did on line. We found Jesse to be very friendly and he responded quickly to the two minor issues we had. The unit could use a little sprucing up, but the location and view make up for any deficiencies. The kitchen had the necessary dishes and utensils and the beds we comfortable. We would definitely book again. The condo complex location is the perfect beach experience, you can walk most anywhere from very casual eateries or more fine dining experiences and of course the beautiful beach you can walk for miles. The complex is beautifully maintained and private. The unit, though with a perfect waterfront view and large balcony, was rough in our opinion; thread bare carpet, chips in tiles and walls, very scuffed trim (simple fixes in our opinion). Cabinets that stick and were troublesome to pull open and broken light bulbs as well, now to the owner's credit, he did tell us before our arrival that if there was anything we needed we should let him know. Overall we look back on our week in St. Augustine Beach very favorably and will return. The condo is located in a great area- restaurants, shops, Publix and Winn Dixie are all close by. The ocean front view is amazing! We loved having our morning coffee on the balcony watching the sunrise and surfers. Everything about the condo is just like the pictures. It was comfortable and clean. The beach here is one of the most beautiful we have seen. Overall we had a great experience! The property is as described and the view of the beach and ocean was amazing. We also found the property owner to be very responsive! Nice condo with great ocean views. Unfortunately, we inadvertantly left behind a couple items of great sentimental value. Despite contacting the owner the day we left, we were not able to get the items returned. He said the cleaning service did not find anything. Not good enough. Its unfortunate that the owner does not have a system in place to deal with these situations, particularly at these prices. Is this indicative of this being an absentee owner? Completely unacceptable.. The pictures don't do this unit justice! 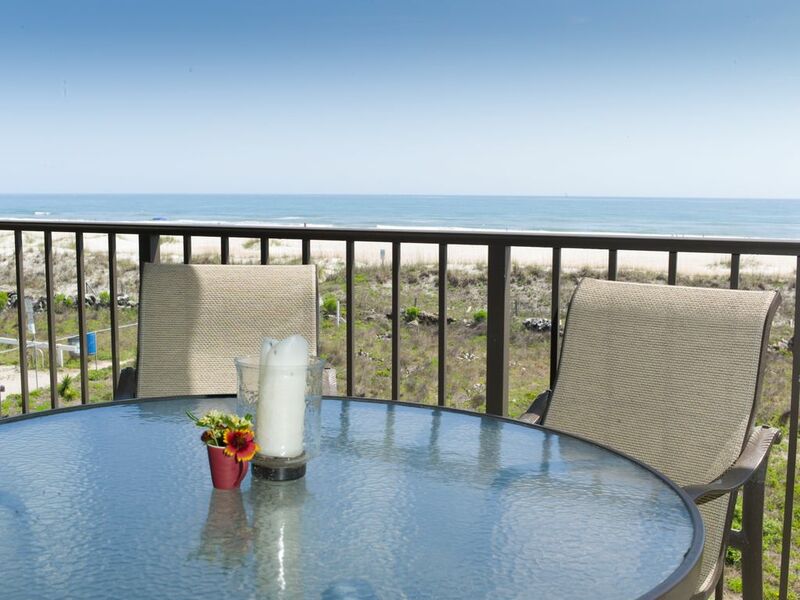 This is a premier oceanfront unit located in the small quaint complex of island south condominiums, which is located on the most desirable part of St. Augustine Beach were cars are not permitted to drive.